There&apos;s no shortage of events happening around the Cumberland Valley this June. Some of the highlights include two car shows, a car parade, festivals, concerts and the largest-running one day street fair on the east coast. See the Top 10 below! The entire family will enjoy the largest and most thrilling all-Ford event in the world. Ford, Mercury and Lincoln fans will have a showcase of over 3,000 vehicles to check out on the National Parts Depot showfield. During this event, you will enjoy great indoor displays of concepts, customs and historically-significant cars and trucks; test drives by Ford Motor Company, a burnout competition, activities for the kids, industry guests, giveaways, NHRA drag racing, autocross for all skill levels and club gatherings. The excitement continues with a shopping experience you won’t soon forget as part of the enormous swap meet, car corral and the Manufacturers Midway for the best in parts buying. Don&apos;t forget about the Ford Parade and Downtown Street Party on Saturday, June 4th! The Foundry Day Arts & Crafts Festival, held the first Saturday in June surrounding Children&apos;s Lake, has over 100 juried craftsmen and artists, mouth-watering food concessions, children&apos;s activities, live music, historic walking tours, and nature programs at the Appalachian Trail Conservancy. Quiltfest, a biannual event, will be held this year at the Middle School. Free parking and shuttles available to all events from Boiling Springs High School parking lot. For pictures of arts and crafts, visit facebook.com/foundrydayboilingsprings. Follow us on Twitter @foundryday for up-to-the minute information. One of the most diverse of General Motors events, this is the place to be each June. Organized by year, make and model, the National Parts Depot showfield will be loaded with top quality restored classics, original muscle cars and modified high-performance new models. Buckle up for autocross action, indoor displays of concepts, customs, performance and historic vehicles, NHRA drag racing, industry guests, activities for the kids special prizes throughout the weekend. You will also find an unbelievable variety of vendors, an all-GM car corral and the Manufacturers Midway vending area. Looking for a bustling, unique, and downright eclectic festival? 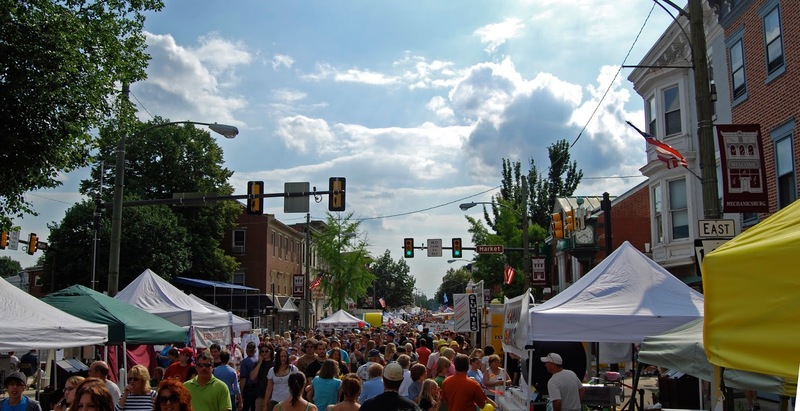 Look no further than Shippensburg&apos;s 11th annual Solstice Arts Festival. Designed for art lovers, artists, and music enthusiasts, this dynamic festival is sure to appeal to everyone in your family. The festival features fine art, music, good food, children&apos;s art activities and creative outlets for all ages. The festival also emphasizes the importance of environmental sustainability as well as personal health and wellness. Several local and regional artists can be found crafting their magnificent creations and selling them at the festival. Festival attendees can watch artists work in a variety of mediums, including pottery, glass blowing, fiber arts, painting, photography, jewel-crafting, and sculpture. Returning attractions this year include The Art Wall, the Eco Village, the Wellness Circle, the Susquehanna Art Museum&apos;s VanGo! traveling gallery, a zip line provided by Philadelphia Mobile Zip Line Co., and even a Renaissance reenactors group. Music lover will enjoy amazing performers on the amphitheatre stage throughout the day. As an added bonus, CPYB will wrap up the 2015/16 season in the four days of our mixed-bill repertory production. Five unique programs mix new works by today&apos;s notable choreographers with classics and audience favorites that ballet novices and loyal patrons alike can appreciate. Among the works, the Company will present a reprisal of legendary George Balanchine&apos;s mesmerizing "Emeralds," from Balanchine&apos;s masterful Jewels. The dancers of CPYB will come together for a new work in their third collaboration with the talented musicians of the Harrisburg Symphony Youth Orchestra. Wednesday, June 15 -- Next Generation Dance: Our four days of spectacular programs start with an inspiring collection of ballets showcasing the Young Talent of CPYB&apos;s next generation. Thursday, June 16 -- New Dance Plus: Program two features a perfect combination of Revivals and New Works. Friday, June 17 -- See the Music Dance: An evening of choreographic gems featuring CPYB/HYSO, Balanchine&apos;s "Emeralds," and more! Saturday, June 18 -- Dance! Dance! Dance! : Artistry and athleticism combine in an exhilarating afternoon encore performance of 20th-century masterpieces and modern day classics. Saturday, June 18 -- Last Dance/Last Chance: A grand finale of encores makes the perfect send-off into summer. Join us at the Mansion for our Music on the Mountain concert with folk group, The Vulcans, from 3 pm to 5 pm and bluegrass artists, Mountain Ride, from 5:30 pm to 7:30 pm. Picnic on the mansion lawn with a view of the whole Cumberland Valley. Food vendors available. “Noted particularly for their creative, artistic interpretation, The Raleigh Ringers have established themselves as America’s premiere professional ensemble.” Dr William A Payn; Retired Chair, Department of Music, Bucknell University The Raleigh Ringers is an internationally acclaimed concert handbell choir based in Raleigh, North Carolina. Since its founding in 1990, The Raleigh Ringers has been dazzling audiences with unique interpretations of sacred, secular and popular music, including famous rock ‘n’ roll tunes arranged just for handbells. Under the direction of David M. Harris, The Raleigh Ringers has performed in 39 US states and the District of Columbia, in several cities in France, Canada, and the UK; live on the nationally syndicated “Bob and Tom Show” radio show; and on the “Hour of Power” at the Crystal Cathedral in California. The Raleigh Ringers has produced two PBS Holiday Specials that have been broadcast in 45 states and on over 250 PBS affiliates. The theme for 2016 is "Newville Honors Our Past and Present Fathers." Friday night&apos;s festivities include a Newville trivia contest, porch judging, live music, parade, and a street dance at the Fountain. Saturday events include a exhibits, entertainment, food and crafts, a 5k race, quilt raffle, duck derby at Laughlin Mill, petting zoo, pony rides, sidewalk chalk art contest, and horse and wagon tours of Newville. East Pennsboro Emergency Services presents its 2016 Carnival featuring live entertainment, kids&apos; activities, rides and games, helicopter rides, and great food. Food Concession opens nightly at 5:00 pm. Helicopter rides will take place on Friday & Saturday from 4 pm to dusk. The event ends with fireworks on Saturday at 9:45 pm. In case these ten events aren&apos;t enough for you, here some other great events to attend this month, including First Friday in Carlisle and Mechanicsburg, PA Speedweek at Williams Grove Speedway, Duncannon A.T. Festival, Fly-Fishing Heritage Day, and A Salute to the Eagles. See the entire June calendar here.